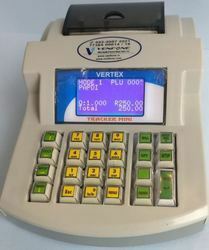 Used in: Restaurant, Garments Shop, Coffee Shop, Bakery, Ice-cream Parlor, Juice Center, Sweet Mart, Grocery Billing, Footwear Billing, Pigmy Collection, Parking Ticket, Petrol Pump, Saloon, Meat Shop Display / Bill Print in Any Language.Inbuilt Battery Backup for 8 - 10 Hrs. USB Pendrive Support for data Backup: All type of Reports can be copied to USB Pendrive. External Printer, Keyboard, Weighing Scale & Barcode Reader Support. 1000 – 30000 Items Entry / 365 Days Sale Report.10,000 – 50,000 Bill Storage.Expandable Memory Card Support. 5000 Credit Customer Accounts & Bill and Cash Paid SMS will be sent to account holder. SMS alert to Owner (Fraud Control): Hourly Sales Report, Cancelled Bill Report, Report Generation time Sale report on missed call. SMS to Customer: Bill info can be sent to Customer Mobile Number. Ø Wi-Fi Enabled KOT Printer FREE Ordering APP for Waiter. Ø SMS alert to Owner (Fraud Control): Hourly Sales Report, Cancelled Bill Report, Report Generation time Sales report on missed call. Ø SMS to Customer: Instant Bill info can be sent to Customer Mobile Number. Ø Display / Bill Print in Any Language. Ø Inbuilt Battery Backup for 8 - 10 Hrs. Ø Expandable Memory Card Support. Ø USB Pendrive Support for data Backup: All type of Reports can be copied to USB Pendrive. Ø External Printer, Keyboard, Weighing Scale & Barcode Reader Support. Ø 1000 – 30000 Items Entry / 365 Days Sale Report. Ø 10,000 – 50,000 Bill Storage. Ø 5000 Credit Customer Accounts & Bill and Cash Paid SMS will be sent to account holder. Wi-Fi Enabled KOT Printer FREE Ordering APP for Waiter. SMS alert to Owner (Fraud Control): Hourly Sales Report, Cancelled Bill Report, Report Generation time Sales report on missed call. SMS to Customer: Instant Bill info can be sent to Customer Mobile Number. Display / Bill Print in Any Language. Inbuilt Battery Backup for 8 - 10 Hrs. 1000 – 5000 Items Entry / 365 Days Sale Report. 10,000 – 50,000 Bill Storage. 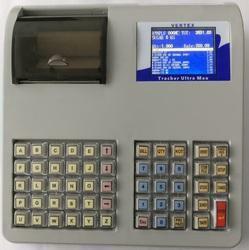 TRACKER MINI is an ideal companion for small and medium retail outlets for billing, accounting and beyond. The basic model with large display, USB pen drive support, weighing machine interface, language printing etc., comes with a host of features that would delight you all the way. Advanced variants have features like SMS alert, larger printer support etc. Designed on a robust platform with Industrial grade components, TRACKER MINI is built for lasting performance. With assured long term support and ease of use, you will find complete value in a compact foot print. 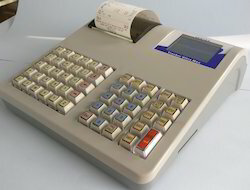 Looking for Billing Machines ?